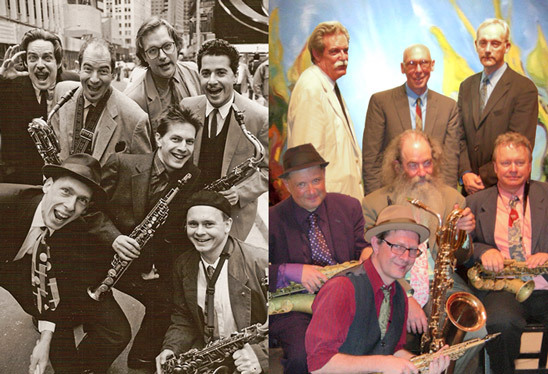 One of the most active saxophonists and composers (theatre, dance, film scores, and jazz music) in New York’s Downtown scene, Phillip Johnston has been active as a performer and bandleader since the 1980s, working with John Zorn, Joel Forrester, Elliott Sharp, Eugene Chadbourne, Mikel Rouse, Wayne Horvitz, Shelley Hirsch, Walter Thompson, Lenny Pickett’s Borneo Horns, Earl King, and Guy Klucevsek. He founded, led, and co-led several highly acclaimed jazz groups, including The Microscopic Septet, Big Trouble, the Transparent Quartet, and Fast ’N’ Bulbous (his arrangements of the music of Captain Beefheart co-led with Gary Lucas, which released a CD on Cuneiform in 2005). Johnston has released more than a dozen albums under his own name and in various groups/ensembles on a variety of prominent labels, including Avant, Winter & Winter, Tzadik, Black Saint, and Koch Jazz. After disbanding the Microscopic Septet, Johnston focused his attention on composing film, theater, and dance scores, in addition to doing work for radio and TV. A prolific composer, he has scored more than a dozen motion pictures, working with such directors as Doris Dörrie, Paul Mazursky (Faithful), and Philip Haas (The Music of Chance). In addition, he’s done scores for silent movies, including F.W. Murnau’s Faust (1927), which premiered at the 2002 New York Film Festival and has subsequently toured Europe and the US. Two CDs of Johnston’s film scores have been released by Zorn: a compilation of film scores, Music for Films (1998, Tzadik), and The Unknown (1994, Avant), a score for Tod Browning’s 1927 silent film. Johnston has also collaborated with artist Art Spiegelman (Maus) on “Drawn To Death: A Three-Panel Opera”. The growing friendship between them led to Spiegelman’s offer to contribute the cover art for the Microscopic Septet re-releases on Cuneiform. In 2005 Johnston moved with his family to Sydney, Australia, where he leads The Coolerators and SNAP and writes music for film and theatre. He continues to perform in Europe and the US from time to time. Pianist, composer, and arranger Joel Forrester is one of the most prolific composers to emerge from New York’s Downtown scene and, according to The Paris Free Voice, “the world’s finest improvisational accompanist to silent films.” Composer of more than 1200 tunes, Forrester co-led the critically acclaimed Microscopic Septet with Phillip Johnston and has played as either leader or member of Private Life, The Illustrious Others, and People Like Us, Forrester has released albums on Ride Symbol, Koch Jazz, and Koch International. Forrester is perhaps most widely known for composing the theme song for National Public Radio’s Fresh Air with Terry Gross (recorded by the Microscopic Septet), which has been played and heard on American radio more often than any other jazz composition in the last 28 years. Forrester actively performs in both New York and Paris; he has played in Paris at the Louvre, the American Center, the Forum des Images and the Musée d’Orsay and in New York at the Film Forum, the Brooklyn Museum, and the Anthology Film Archives. Alto saxophonist Don Davis has been a member of The Microscopic Septet, Dr Nerve, and New York Gong. Additionally he has performed and/or recorded with LL Cool J, Michael Mantler, Carla Bley, Karl Berger, Marc Black, Material, The Waitresses, Toots and the Maytals, Danzig, The Swollen Monkeys, Ed Broms, and others. He is currently freelancing in New England and performing with The Davis/Deleault Duo, The New Hampshire Jazz Orchestra, Larry Simon, and others. Follow Don Davis on Twitter. Alto and soprano saxophonist Mike Hashim has enjoyed a long and fruitful career in which he has played with a wide variety of musicians and traveled the world as a jazz ambassador. He attended the Creative Musicians Workshop in the summer of 1974, where he studied with avant-garde and post-bop explorers Dave Holland, Lee Konitz, Leroy Jenkins, and Milford Graves. Residing in New York, he later took lessons with instructors as diverse as Jimmy Lyons, Andy McGhee, and Phil Woods. A longtime member of the Widespread Jazz Orchestra, Hashim has also worked with a number of great blues men, including Muddy Waters, Sonny Greer, and Clarence “Gatemouth” Brown. He has led his own quartet since 1979 and has collaborated for years with pianist Mike Ledonne. In 1992, as part of a Carmichael tour sponsored by the USIS, Hashim was a member of the first official jazz group to play in China since 1949. A composer for film, TV, and dance, Hashim can be heard on his own albums for Stash, 33, and Hep. Saxophonist Dave Sewelson is an active member of New York’s avant jazz scene. He has played and/or recorded with Wayne Horvitz, Robin Holcomb, Saheb Sarbib, John Zorn, Roy Campbell, Mofungo, Elliott Sharp, Dee Pop, Frank Lowe, Pat Place, Billy Bang, Susie Ibarra, Bobby Radcliff, Dave Douglas, George Gilmore, Kyosuke Otsuka, the Microscopic Septet, and Fast ’N’ Bulbous. Additionally Sewelson is a member of William Parker’s Little Huey Creative Music Orchestra and the leader of Sewelsonics and The Daves. Bassist and tuba player David Hofstra has performed on close to 100 CDs since 1980. Constantly active on the New York jazz scene, he has recorded with Wayne Horvitz, Bobby Previte, Michael Callen, Bobby Radcliff, Bill Frisell, The Waitresses, Robin Holcomb, John Zorn, Elliot Sharp, The Metropolitan Klezmer Orchestra, Mark Ribot, Lou Grassi, Sewelsonics, William Parker, and many others. Drummer Richard Dworkin has been active on the New York scene since 1980 when he began playing with the Microscopic Septet. He has appeared on over 35 CDs, drumming for James Chance, Alex Chilton, Philip Johnston’s Big Trouble, Bobby Radcliff, Harry Shearer, Samm Bennett, Eric Anderson, Fast ‘n Bulbous, Michael Callen, and others. Appearing in sessions with William Parker in the 1970s and the Microscopic Septet in the 1980s, saxophonist John Hagen released his first solo album, Segments, on Cadence Jazz Records in 2004. He replaced George Bishop, the original tenor player in the Microscopic Septet, early on and performed on Take the Z Train and the unreleased pre-Take The Z Train session. Saxophonist Danny Nigro has appeared on recordings from Plant the Seed (Plant the Seed, OFMB, 2005), and The Dalton Gang (Last Year’s Waltz, Second Step Music, 2006). He toured Europe in 1984, subbing for Paul Shapiro, and appears on Let’s Flip! Saxophonist, flutist, composer, and bandleader Paul Shapiro has been active on the New York scene for over two decades. He currently leads two projects: his jazz group Midnight Minyan and his ’40s Yiddish swing project, Paul Shapiro’s Ribs and Brisket Revue. As a solo artist he has released two albums, Midnight Minyan in 2003 and It’s in the Twilight in 2006, both on the Tzadik label. He has also recorded and/or worked with such diverse artists as Lou Reed, Brooklyn Funk Essentials, Michael Callen, Jay-Z, Ben Folds Five, Steven Bernstein, John Zorn, Ofra Haza, Naughty By Nature, Marc Anthony, Frankie Knuckles, Elliott Sharp, Wayne Horvitz and Queen Latifah, Majek Fashek, Khaled, and many others. Composer and saxophonist John Zorn has been a leading figure in the New York Downtown scene since the 1970s. As a key figure and major player in the avant scene, Zorn has been a member of Naked City, Cobra, and Masada, among many other bands, often recording albums at a prolific pace. Zorn has also recorded as a solo artist and founded the Tzadik label, specializing in experimental, jazz, and avant-garde music. Zorn was the original alto saxophonist in the Microscopic Septet and appears on the unreleased pre-Take The Z Train session.